I love to show how you can take a main image, change a few elements and have two totally different looking cards. 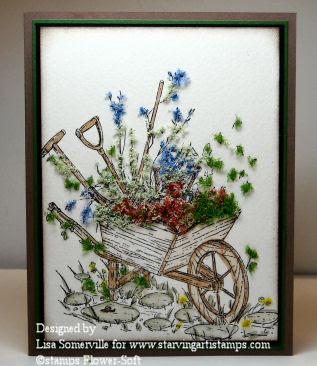 Starving Artistamps just started carrying the Flower Soft Stamps - and I just had to have my hands on the Wheelbarrow Set. 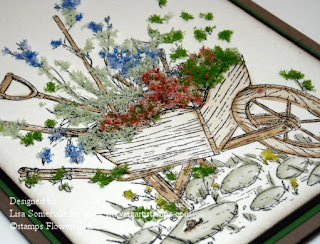 The Wheelbarrow is designed so that you can change the stamps that you put into the Wheelbarrow - there's Harvest, Autumn and Flowers. 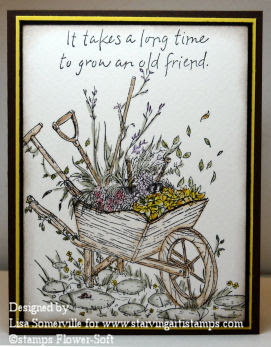 For these particular cards, I used the Autumn image to add to my Wheelbarrow. On both my cards, I stamped my images in Black Archival on Watercolor Paper to get started. For this card, after stamping my images, I added color using the Marker Water Coloring Technique. Stamped my sentiment (retired SU), in Black, then sponged Chocolate Chip ink on the edges, then layered onto my base card. For this second card, after stamping my images, I did add some color using the Marker Water Coloring Technique, but then I added some Flower Soft for dimension. I found one of the easiest ways to add the Flower Soft was to stick my old unused Stylus (it's one with a fine ball point) into the PVA Glue, then dab where I wanted to add the Flower Soft. Sprinkle on the Flower Soft, tap lightly, then tap off the extra. Sponge edges with Chocolate Chip ink, then layer on base card. I left the sentiment off this second card, as it seemed to be too close to the top edge after adding my Flower Soft. It does look a tad naked without the sentiment, don't you agree? This is so "real" looking, makes me want to touch & feel! Just beautiful, have to get some of that stuff! I love them both! That flower soft is so pretty. What a beautiful card it makes. What about adding a ribbon bow to the top with a thin ribbon? Thanks for sharing! Beautiful!!!!! I love them both!